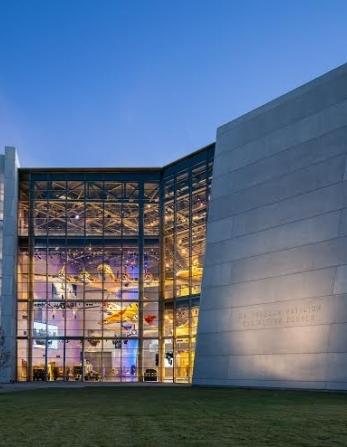 May 10, 2019 ||| 4:00 p.m. - 6:00 p.m.
Join The National WWII Museum and special guests as we celebrate the opening of our latest permanent exhibit, Bayou to Battlefield: Higgins Industries During World War II. On display in Louisiana Memorial Pavilion next to our own LCVP, or “Higgins boat,” the exhibit is made possible thanks to a generous gift of Beverly and Lester Wainer in honor of Lester Wainer’s WWII service in the US Navy, Pacific theater, aboard the USS Clay (APA-39). The presentation will begin with opening remarks by Museum President & CEO Stephen J. Watson, then proceed to a presentation by Curator Joshua Schick about Higgins Industries and the creation of the exhibit. Beverly Wainer, whose husband worked at Higgins Industries before joining the US Navy to serve in World War II, will then share personal reflections of her husband and their experiences. Andrew Jackson Higgins, a Louisiana-based lumber importer and exporter, established a small boatbuilding business in the early 1930s called Higgins Industries. His goal was to design a boat for use in the oil and timber business that could carry heavy loads in the shallow, obstacle-ridden swamps of coastal Louisiana. His first boat, dubbed the Eureka, made Higgins a successful businessman and set the stage for him to take on the US Navy and large East Coast shipbuilders, and change history. Adapting the Eureka into the Landing Craft Vehicle Personnel (LCVP), Higgins changed how amphibious warfare was fought by enabling the landing of troops and supplies over an open beach. Higgins and his loyal workforce expand his operation from 75 workers and one factory to more than 20,000 workers and seven factories in a few short years. Wartime production by Higgins Industries numbered tens of thousands of combat watercraft, including PT boats, supply ships, and lifeboats, as well as radios, aircraft wing panels, and precision parts for the Manhattan Project. Higgins Industries products and production levels were a key component to Allied victory in World War II. The program and reception are free and open to the public but please register to attend. For more information or to register, call 504-528-1944 x 412. If you can’t make it to the Museum, watch the presentation at Livestream.com.